The National Cricket Centre, created in 1998, was the first building first building belonging to Glamorgan CCC to be completed at the ground. Before then the Club only owned a small office area. The National Cricket Centre was funded with grant and National Lottery assistance. The ground floor includes the Indoor School, used by Glamorgan’s professional players and Welsh youth squads, among others. The Legends Lounge, also on the ground floor, celebrates some of the great names in the club’s history. On the first floor is the CC4 Museum of Welsh Cricket, the first sport-specific museum in Wales. 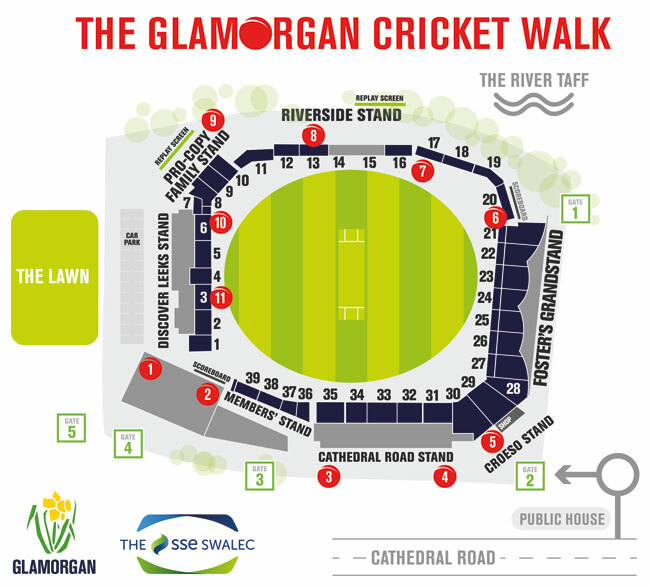 The displays trace the story of the game since the 18th century – demonstrating that cricket is the oldest team game in Wales. Visitors can also see how cricket equipment has changed over time. Many of the exhibits have been donated by former Glamorgan players or their families. The museum’s multimedia facilities include video films which celebrate the Club's history. On the centre’s top floor are hospitality suites and the Lewis Lounge, which celebrates the achievements of Tony Lewis and his Glamorgan team in winning the 1969 County Championship. The QR codes for this page are at position no 2 (shown in red) on the map below.